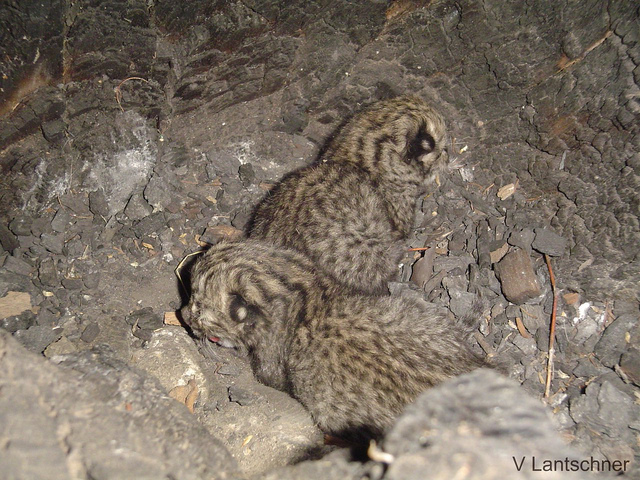 The Geoffroy’s Cat is small (approximately 4.3 kg), solitary and predominantly nocturnal. Its coat colour varies from brilliant ochre in the northern parts of its range, to a silver grey in the south, with shades in between. The black tipped tail is about half of the head-body length and has several black rings. Geoffroy’s Cats are solitary and largely nocturnal. They usually give birth to one or two kittens. They are partially arboreal and good swimmers which readily enter water. Diet varies by location but consists mainly of small mammals, and may include some birds, hares, fish and frogs. Geoffroy’s Cats live in Argentina, Bolivia, Brazil, Chile, Paraguay, and Uruguay between sea level and 3,800 meters altitude. Although they prefer dense cover, they can be found across a wide variety of habitat types including the scrubby woodland and dry forests of the Chaco. Most of their range is arid or semi-arid, and they seem to be tolerant of habitat alteration related to livestock management. The conservation status of the Geoffroy’s Cat has recently been downgraded by IUCN to Least Concern, because it is abundant and widespread over large parts of its range, including areas of Bolivia and Argentina. Threats at a local level include road-kills and persecution (due to predation of domestic poultry), particularly in the Pampas grasslands. 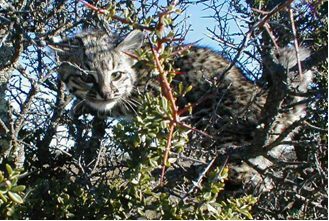 Potential negative impacts from current trends in climate change have been proposed and studies have shown that Geoffroy’s Cat is vulnerable to drought.